Team Eco-Chaser from the School of Engineering ranked number one in the Prototype Compressed Natural Gas (CNG) category with a mileage of 95km/liter at the recent Shell Eco-Marathon Asia 2016 held in Manila, Philippines. The team bested 117 student teams from 17 countries across Asia, the Middle east and Australia. Monash Malaysia’s second team, Team Monash Alpha came in fourth place for the Urban Concept, Alternative Fuel Category with a recording mileage of 61km/liter. The competition had two categories - Prototype and Urban Concept. In the Prototype category, teams focused on maximising fuel efficiency through innovative design elements, such as drag reduction, where else the Urban Concept category focused on roadworthy fuel efficient vehicles. The Shell Eco-Marathon competition is unique as it challenges students to design, build and drive the most energy-efficient car. Winning teams were determined by the mileage achieved on a litre of fuel, rather than speed. According to team leader of Eco-Chaser, Tan Wei Shen, it took six months for members to design the cars, and another four more to build them. From vehicle design to financing, the students managed their projects from start to finish. Advised by Dr Darwin Gouwanda and Dr Kenny Tan, both Senior Lecturers at the School of Engineering, the Monash teams were made up of a total of 39 students, including supporting members and the sponsorship team. 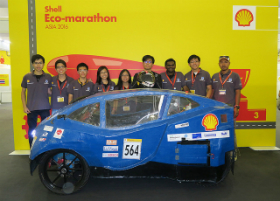 This is the third year that Monash has participated in the Shell Eco-Marathon competition. Juniors who worked together with their seniors during the competition, take the lead and participate the following year. This helps teams design better and create more efficient cars. 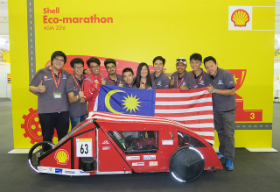 “We are all really excited and proud of our students achievements at Shell Eco-Marathon. At the School of Engineering, we encourage and support participation in External Design Competition activities. This provides students with the opportunity to apply what they have learned in the class to the real world. In the case of the Shell Eco-Marathon, they would apply concepts and design of renewal energy and sustainability. They are also able to develop their skills and abilities in leadership, teamwork, communication and how to engage with communities,” said Professor Anthony Guo, Head of School of Engineering at Monash Malaysia. The USD$2,000 prize money will be utilised for the Shell Eco-Marathon development in Monash. It was certainly an achievement and experience for the student teams as well as their advisers. Shell Eco-marathon began in 1939 at a Shell research laboratory in the United States as a friendly wager between scientists to see who could get the most miles per gallon from their vehicle. In 2010, the inaugural Shell Eco-marathon Asia was held in Malaysia, up until 2013. Since 2014, the event has been held in Manila, Philippines, which will continue to host the event until 2016.